Recently this brochure fell out of the back of the Sunday paper and for once I actually took notice. It was colourful and I immediately took to the items on the front cover. Who doesn't love a little retail therapy and if I can shop from the convenience of my media room and have parcels delivered to my front door, even better. When I started blogging, this was the kind of business I thought I would start one day. Gathering together a range of gorgeous and unique products to recommend to my readers. The Hard to Find website is kind of like an online shopping mall, full of fabulous boutiques offering individual and out of the ordinary products that you can't find just anywhere. And the lovely girls at Hard to Find have brought them all together on one website for our shopping convenience. As a heavy user of online products and services, this is absolutely my thing. So on the basis of what I saw in the brochure, I decided to approach the company, basically as I loved what they were doing and I thought you, my readers would love this kind of thing too. 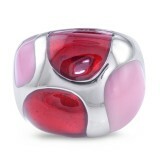 Hard to Find offers an extensive range of products for any occasion. I have just listed a few here from their website. 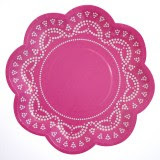 As you know I am mad about doilies and vintage lace, so I was drawn to these doily inspired paper plates. They come in packs of 10 and are also available in the most gorgeous coastal blue. 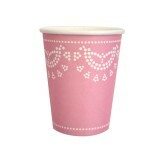 There are also matching paper cups, which would make any little or big girls' party table look so pretty. I also thought these bean bag chairs were adorable. I'm thinking of something like this for the littlest Beach House Brats room. And how about this beautiful paper cut out? So very pretty!! This uber stylish bottle cooler caught my eye too. I adore it's clean lines and the shoulder strap is great when you need to walk to your picnic spot. 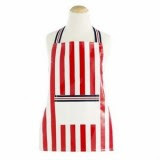 And for cooking those cup cakes, every little girl needs an oil cloth apron. This red an white striped number is very smart indeed. And the next time I travel, I think I will definitely need this beautiful passport holder. Actually, who am I kidding? The chances of me travelling in the near future are very slim, but I do live in hope. The best part about our job is hunting for those gorgeously unique products that you often find in a stylish magazine, a cool new design store, a tucked away boutique or whilst browsing a groovy urban market. The sellers we've selected were all found this way, and each one of them brings something special to hardtofind because (apart from their fabulous products) each one of them is passionate about their business, as we are. Each boutique (or seller) will dispatch the products directly to you, so you will receive several parcels if you have bought from several sellers. Most sellers will dispatch a product within 48 hours of receiving your order, unless a product is made to order, in which case that will be stated on the product page. So in the interests of honestly ladies, what did I get out of this? 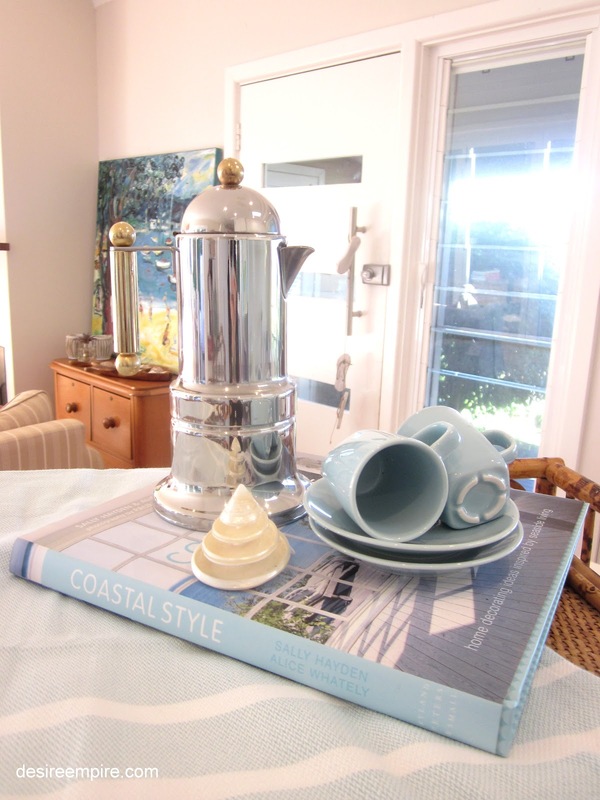 You know I always blog it like it is at The Beach House. I was paid a token amount and I also received these gorgeous products. But the reason I approached these guys, is 'cause I thought this website was fabulous. I am completely in love with the linen, which will definitely be going into the cook book shoot. 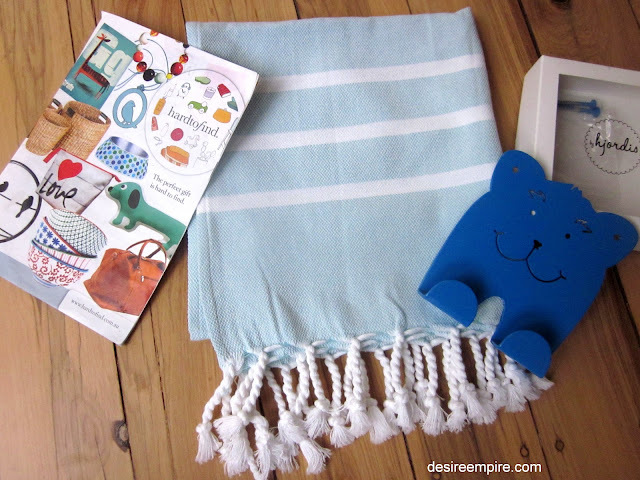 And the stunning little cobalt blue teddy hook, is going to a little birthday boy around these parts very soon. So if you want an affordable bespoke gift for you or a friend go here. I promise you will not be disappointed. Have a great week ladies. Happy shopping!!!!! I very rarely ever shop online. The only time I do is to buy cross stitch charts, and even then, it's usually from a brick and mortar store near where I used to live in Indiana. I still prefer old-fashioned shopping - maybe the fact that my husband works in retail is one of the reasons I will support a brick and mortar store over an online site any day of the week. I can understand old habits are hard to break..... but this site has gorgeous stuff that is as they say, 'hard to find' elsewhere. I love online shopping as it's so much fun. It's like receiving a birthday present every time a parcel turns up at the front door and Lord knows I need more of those. Especially seeing I have to buy my own these days. Have a great week. I just checked out the website. They look great, love the products they have on website. Thank you so very much for the information. it looks like a great website. so many things! As someone who lives in a country town online shopping can sometimes be the only way I can find things I want. I will definitely be checking this out! Looks like a fun website! I see so many things that I just adore! Great concept and the products look fab. I must admit I prefer shopping in real life, but I'm going to have to get used to more online shopping come the end of the month! What a lovely linen towel! Stunning colour. I'm a huge fan of online shopping too :) Can I ask who the artist of that stunning artwork in the corner of the shot above is? Love it!